The club kicks off the 2016 season with 3 days of winter fun at Mammoth Mountain, one of North America's premier ski/snowboard resorts. The chartered bus departs from Santa Barbara Thursday afternoon at 3:00PM and leaves from the mountain on Sunday at 4:00PM. This gives you 3 full days of Skiing, Boarding, Cross Country etc without the hassle of driving. We will be staying at the Shilo Inn in town with easy access to dining and evening entertainment, indoor pool, hot tub and sauna to relax after a long day of skiing/snowboarding. See old friends and meet new ones with our Friday Get-Together's. Forbes Magazine used the criteria of “Awesomeness” when it voted Jackson Hole the #1 ski area in the US three years in a row. Jackson Hole Mountain Resort has a much deserved reputation for challenging expert terrain and although half of the trails are expert runs the other half are not, so there is plenty to do for every level of ability. We will be staying at the remodeled 49er Inn which is conveniently located in downtown Jackson Hole just 3 blocks from the Town Square and a short walk to some of the area’s finest dining, shopping and entertainment. Amenities included are; continental breakfast, indoor / outdoor hot tubs, swimming pool, fitness room, and sauna. The club is heading back to the world famous Lake Tahoe with its spectacular scenery of deep blue waters and white snow-topped mountains. 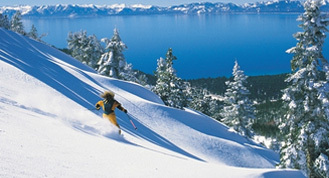 Enjoy the ski resorts of Squaw Valley, Alpine Meadows and Northstar, something for everyone. All of our club members will have a chance to reunite at some of the top resorts in North America. Lodging will be in nearby Reno at the magnificient Grand Sierra Resort. Bring your party hat-because Reno has lots to see and do. Dancing, live music, many excellent dining choices, all within the 2000 room Grand Sierra Resort. Board the chartered bus in Goleta, enjoy movies, wine, snacks, sandwiches. Prepare for one of the best trips of the season! Come enjoy the spectacular winter scenery of the Canadian Rockies. Banff is known for world famous skiing and snowboarding and with the interchangeable tri-area lift ticket which is included in the package we will have access to all three resorts: Lake Louise, Sunshine Village, Mt. Norquay. We will be staying at the Ptarmigan Inn centrally located in Banff National Park only steps away from the downtown area where you can enjoy fine dining, lively nightlife and a thriving arts scene. Second Mammoth Trip of 2016 season with 3 days of winter fun! The chartered bus departs from Santa Barbara Thursday afternoon at 3:00PM and leaves from the mountain on Sunday at 4:00PM. This gives you 3 full days of Skiing, Boarding, Cross-Country and more, without the hassle of driving. We will be staying at the Shilo Inn in town with easy access to dining and evening entertainment, indoor pool and hot tub and sauna to relax after a long day of skiing/snowboarding. See old friends and meet new ones with our Friday Get-Together's. 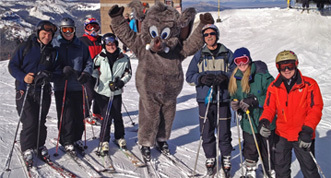 3 days of winter fun at Mammoth Mountain, one of North America's premier ski/snowboard resorts. Due to the low number advanced signups we have convert this from a bus trip into a drive up trip. We will be staying at the Shilo Inn in town with easy access to dining and evening entertainment. We will have a pizza party, hot tub fun.